Art cowboy and potential extra-terrestrial James Turrell shows us mere mortals what it is to see light. Though we spend most of our waking hours seeing various objects as they pass through light's generous rays, we rarely spend time gazing at light, the thing itself. 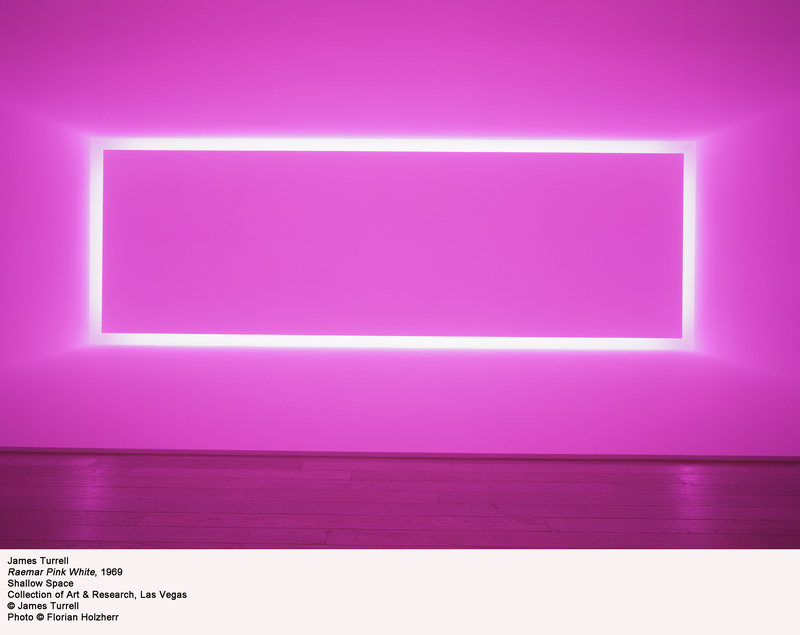 As Turrell famously said, light "is not the bearer of revelation -- it is the revelation." 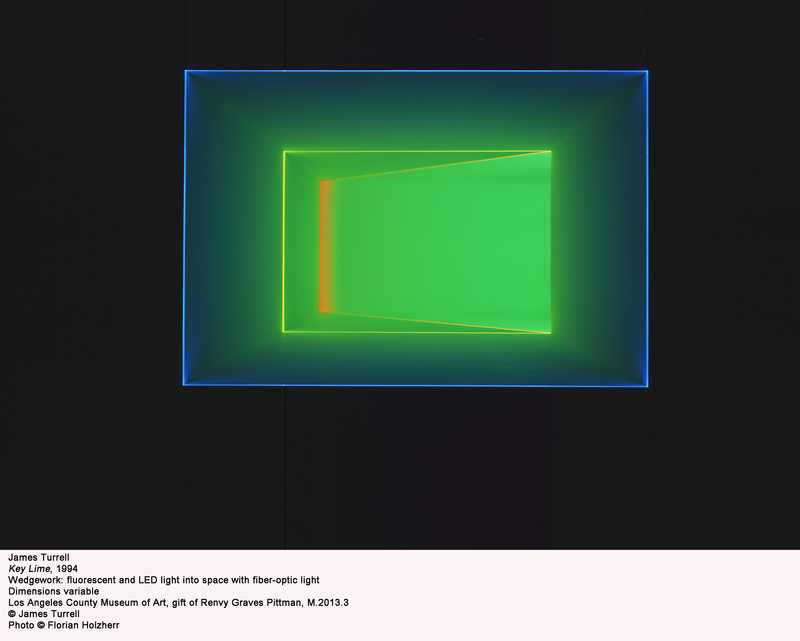 In his LACMA retrospective, Turrell gives pure light a space in which to dwell. Viewers come face-to-face with the act of their own seeing, thus re-thinking what it is to visually digest a thing. (And if this thing has no discernible size, no texture, no weight -- is it still, then, a thing?) 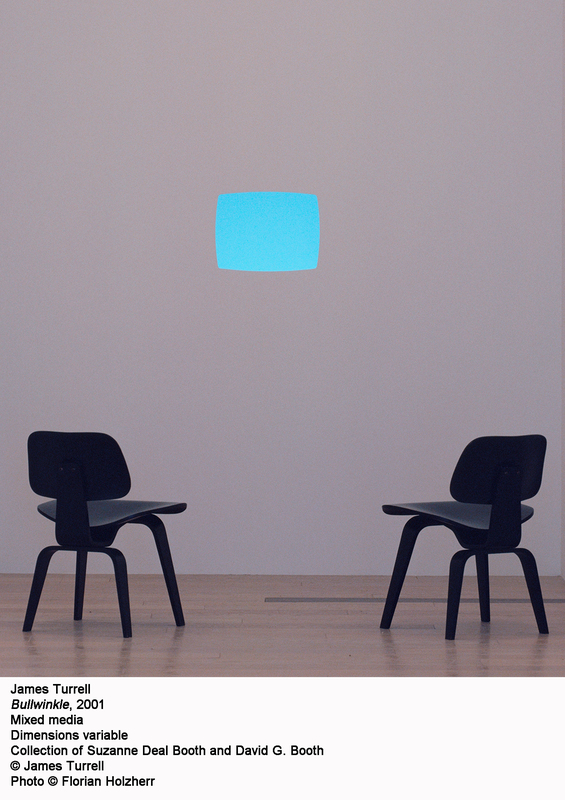 As if this perception-altering trip wasn't enough, Turrell takes it a step farther. We experience not only what it is to see light but to breathe it, to hear it and to dream it. 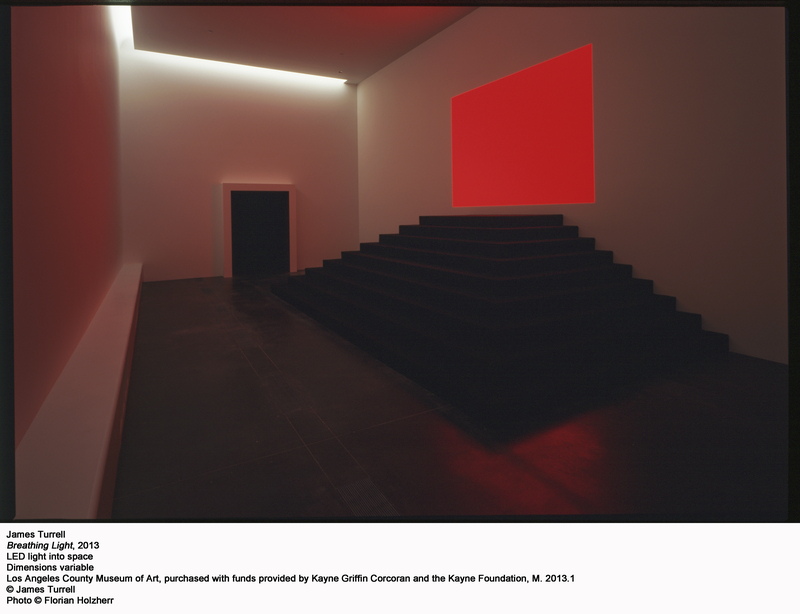 According to art legend -- or the LACMA exhibition guide -- Turrell was first inspired by light's properties in an undergraduate art history class at Pomona. It wasn't the class itself that caught Turrell's eye, but a beam of light shooting from a slide projector through the darkness. When removed from its functional existence and examined in its own otherworldly flesh, the spiritual properties of light become impossible to ignore. 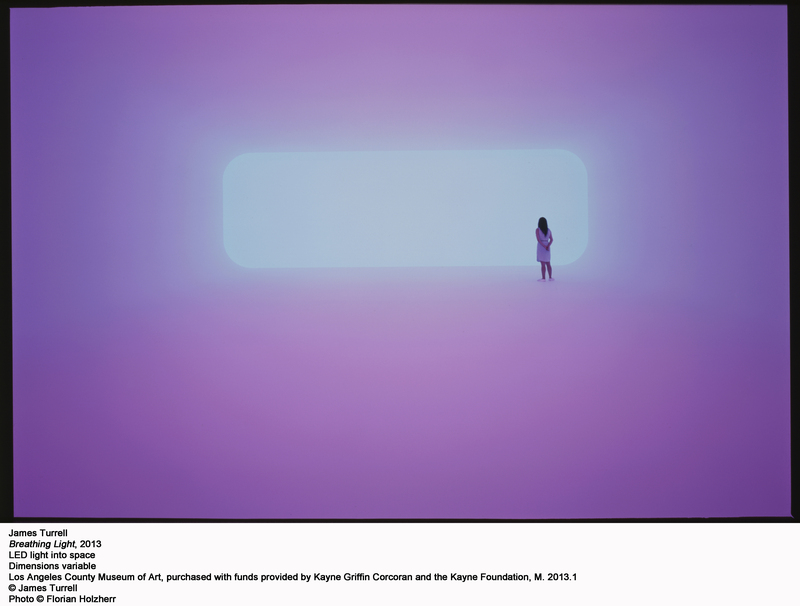 Turrell's exhibition features two "special installations" -- special in the sense that they allow only one or two visitors at a time and are already sold out until the exhibition's end in April. The first, "Perceptual Cell," is an immersive light program taking place inside a spherical chamber, which you enter on a sliding bed. In my case, I approach a futuristic white pod the middle of the museum, fit for one, and sign papers handed to me on a clipboard by two young ladies donning lab coats. "It looks like an MRI machine," a passing visitor remarks with a chuckle. "There are no similarities between Turrell's work and an MRI machine besides the bed, I assure you," one of the lab-coated lady says in a very serious British accent. She asks me whether I prefer the "hard" or "soft" light experience, both made from the same materials -- strobe lights, color washes and flashing patterns. The soft is more relaxing; the hard, she warns, really penetrates. You only lie in the Perceptual Cell once, eh Drake? Hard it is. Onto sliding bed I slip, belly up, into the cell, which promptly shut to the outside world. Overhead a glowing blue alien womb consumes me. Somehow the blue is incredibly close and miles away, reminding me of the giddy frustration of pinning down the sky's measurements as a kid. The light slowly darkens to a richer topaz shade... and then takes off into a hallucinatory color storm. For twelve minutes I am immobile, completely at the whim of Turrell's mad scientist-esque creation. There is no space between the light and the eye; the seen has invaded the seer and refuses to let up. Even if I close my eyes the color-patterns continue at rapid fire. They've violently occupied the space my dreams usually dwell, pushing onward, between my ears, in my stomach. Whether my eyes are opened or closed what I see is the same, suggesting seeing is something very different than I assumed all along. While normally light is a tool that reveals things to me, today it holds me in its grip. I am only its vessel, through which the revelation can fully take shape. The Cell's sister piece, entitled "Dark Matters," is in all respects its exact opposite. Two viewers are set off into a pitch-black labyrinth for ten minutes, directed only to follow a railing, take a seat and wait. Eventually, hopefully, you will see something. "If you aren't into it you can just leave early," the docent says casually, before ominously cooing "these are dark matters," as if we are on a Disneyland ride gone horribly awry. Where the visuals in the Cell were inescapable, in the dark room they are barely graspable. 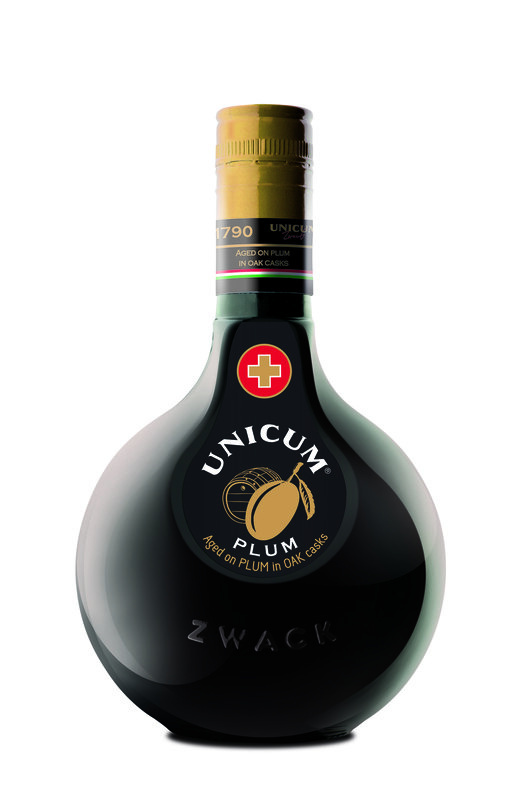 For the first five minutes all I can see is pure black, thick yet without form, with no ostensible beginning or end. I start to panic, worried I won't see whatever it is I am supposed to be looking out for, unsure if the hair-thin lassoes of gold lacing the room are real or imagined. After about seven minutes I realize I was looking in the wrong direction and I see it, ever so faintly, still not sure what exactly it is. The remainder of the exhibition continues to provide intense experiences of seeing seeing. Rooms lit up with various shapes and colors transport you from an ethereal modern-day heaven to a Lynchian sci-fi labyrinth in a matter of footsteps. Some installations are reminiscent of other kinds of looking, from TV watching ("Bullwinkle") to video game playing ("Breathing Light.") Except instead of watching cartoons you're gazing into an artificial sky and instead of playing video games you're in one. No matter how long you stare at Turrell's lightscapes, it's virtually impossible to decipher what you're looking at -- is this light-shape jutting out or in? (Actually it's a shapeless cavity in the wall, but thanks for playing!) Soon the expectations of knowing are dropped from the experience of seeing -- and all that's left is pure perception. The exhibition experience can be summed up as anything from trippy -- Christopher Knight recalled a visitor joking about the museum shop selling marijuana -- to religiously transformative, depending on how you see it. As Roberta Smith said, "you may or may not see God," but you will surely see, perhaps for the first time. 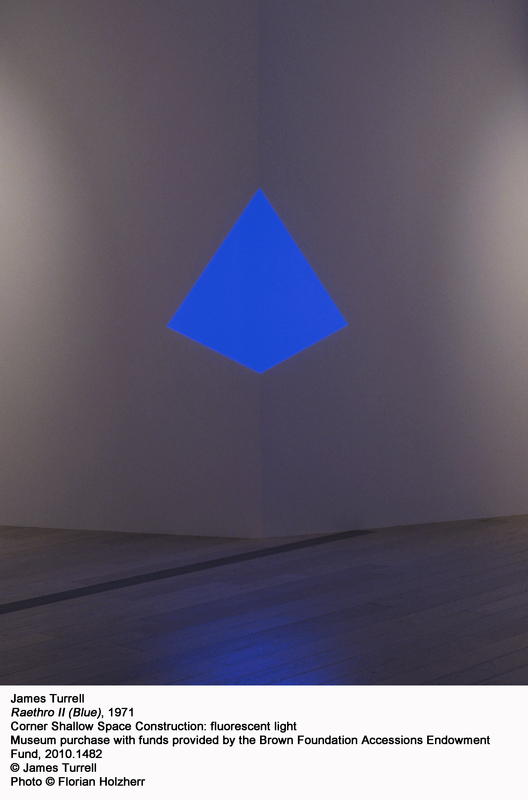 "James Turrell: A Retrospective" runs until April 4 at the Los Angeles County Museum of Art. 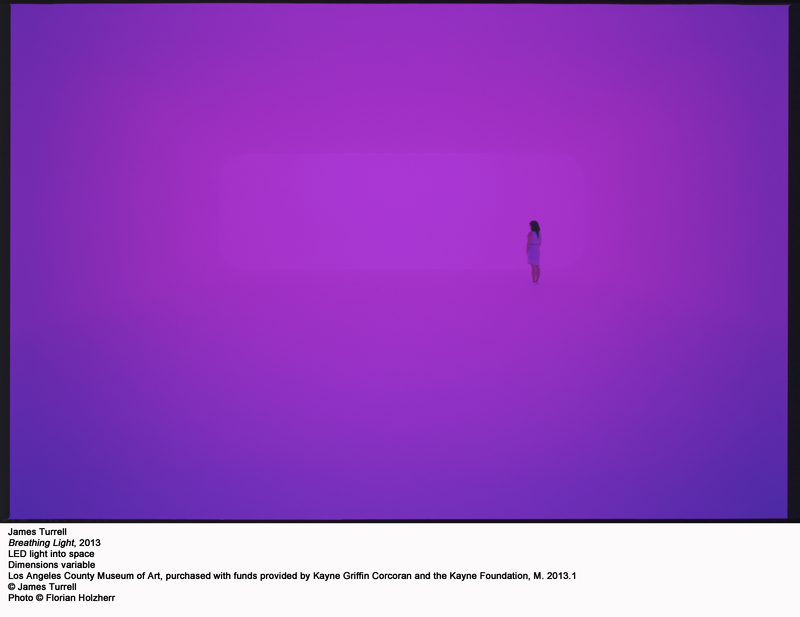 If you're in New York, check out his current exhibition at the Guggenheim. Let us know your thoughts in the comments.